This is what the crock pot looks like…it’s teeny. I couldn’t take a picture w/the playkitchen because the girls took a crayon to it and it needs repainted before I show it to anyone again. My girls have been trying to steal my smallest crockpot since I got it at a yard sale last summer. It’s cute that they want to be like their mom, but it scares me to find it plugged in in random places around the house. I’ve decided that since I’ve only used it once in the year that I’ve had it, I don’t mind giving it to them for their play kitchen. The only issue was to make it not work so that they don’t burn themselves or the house down. This was solved by a simple snip to cord on the back and voila…they now have a cute addition to their play kitchen. I’ve never seen anyone else do this, so I thought that it might be a fun addition for other play kitchens. 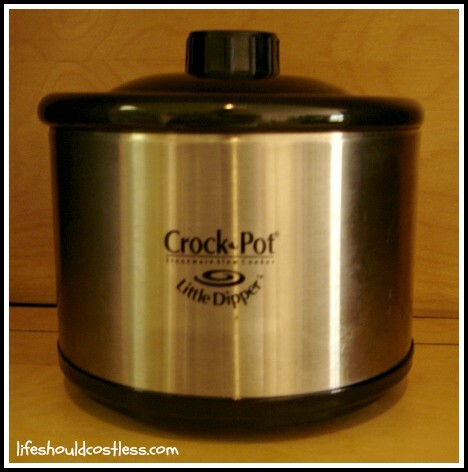 These “little dipper” crockpots are at thrift stores and yard sales frequently, but keep in mind that if you paid more than a buck you got a bad deal.